When Steve Wynn opened the doors to his $2.7 billion mega-resort, Wynn Las Vegas, it was easy to see that no expense was spared in creating the finest hotel and casino in Las Vegas, perhaps the world! That level of unlimited decadence is nowhere more present than at Tryst nightclub. 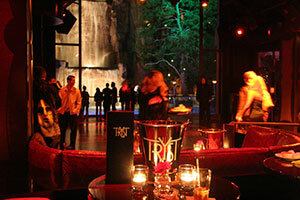 Tryst clearly raises the bar, in regards to nightlife, to a level never before imagined. If you are lucky enough to make it into the most exclusive nightclub in Las Vegas, you will be rewarded with a nightlife experience like no other. An "intimate affair" as translated in French, Tryst shows its intimacy as you stroll down the quaint marble staircase to a small cozy lounge area before entering the club. Walking down a narrow corridor, lined with rich velvet wall covering, nothing can prepare you for what you are about to see as you walk into the main room. 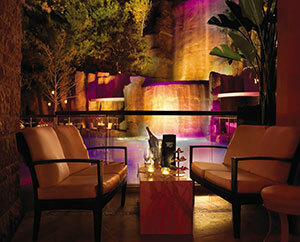 Just beyond the dance floor sits a lagoon with its very own 100 foot, 3 tiered waterfall. The feature is quite large and very impressive. The lagoon is surrounded by mature trees and realistic looking rock features. Once you get over the unbelievable outdoor area of Tryst, you notice the rich materials that make up the interior space. The beautiful woodwork, the ample VIP seating, the general layout of the nightclub all lend to the overall majestic feel. Two main bars inside the nightclub provide cocktails to the upscale crowd, with a smaller service bar to the left side of the facility. This area of the club is decorated to resemble a library or den, but the real attraction is the pole-dancing stage that begs female patrons to live out their exotic dancing fantasies. Service is second to none at Tryst nightclub. The staff of waitresses and busers work hard to make sure everything is perfect. The bottle service is a thing of beauty, with a high regard to detail. 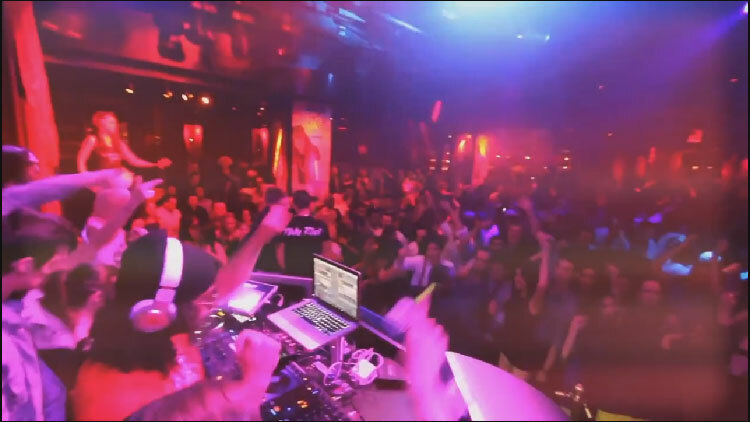 The music is always fantastic and keeps the crowd dancing all night long with popular Top 40 beats mixed with Hip-Hop tracks. One word that best describes Tryst nightclub is "exclusive" and it will be difficult to beat the visual masterpiece that $2.7 billion helped create.